Rainfall and reservoir supplies are undoubtedly in shortage in comparison to levels recorded since records began. Many people feel that this is due to global warming and there is widespread concern that if global warming continues at its current level, or increases, their will be significant water shortages worldwide, resulting in a water famine in, at the least, the hottest and driest parts of the world. As rainfall has been so short in recent years, resulting in a public drought order being issued in England and Wales for the eleventh time since 1990, saving water has become a high priority for environmentally conscious individuals, institutions and companies. Bans on hosepipes reflect the huge amount of water that they use. Keep hosepipe use to a minimum throughout the year, regardless of whether a drought order has been issued. Remember: More damage is done to the garden in non-drought conditions by over-watering, than by under-watering plants! 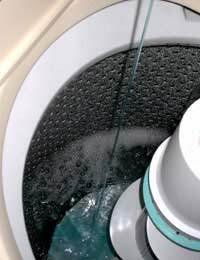 Only wash full loads of clothes, or, if possible, keep clothes washing to a minimum and use the 'half load' facility on your washing machine. Use an energy efficient washing machine. These can be identified by the 'EU Energy Efficiency Label', which will bear the classification 'A' if it is efficient. Wash vegetables in a bowl and keep the water for the garden. Run short showers rather than baths. Replace the washers on dripping taps. Save water from boiled vegetables for vegetable stock, or use it for watering when it has cooled down. Place a filled one litre bottle of water in old toilet cisterns, thus reducing the amount of water used when the toilet is flushed. Wash dishes by hand in a bowl, rather than the sink. Avoid using dishwashers, which waste energy as well as water. Insulate all of your pipes to avoid losing heat. This will save on water use and energy bills. Whilst it is important to save water at home statistics show that there is a great deal of water wasted in the workplace as well. 'Envirowise' promoted 'Water at Work Week' in August 2006, arguing that if businesses placed litre bottles of water in all of their toilet cisterns, they could help to save up to 132 million litres of water daily, as part of a nationwide scheme. Initiatives such as this demonstrate the impact that small behavioural changes at work can have on the environment. Much water is wasted along the supply line, both through faults in reservoir beds and cracks in water supply pipes. 'The new European Water Policy: River basin management, Water Framework Directive (200/60/EC)' was devised to address faults in the management and supply of water and has been implemented under national law since 2003. Water companies now have to adhere to strict standards and can be fined if they do not address wasteful inadequacies in their infrastructure. The Water Act of 2003 obligates public bodies to strive to save water wherever possible. The government backed 'Waterwise' scheme has been setup to advise public sector groups how best to achieve this. Saving water is set to become a prime concern for businesses and individals over the coming years. At the moment, EU and UK government policy on water falls far behind policies that aim to reduce harmful carbon emmissions. If we are to live in a sustainable and healthy environment, individuals, corporations and governments must make greater concerted efforts to reduce water consumption.